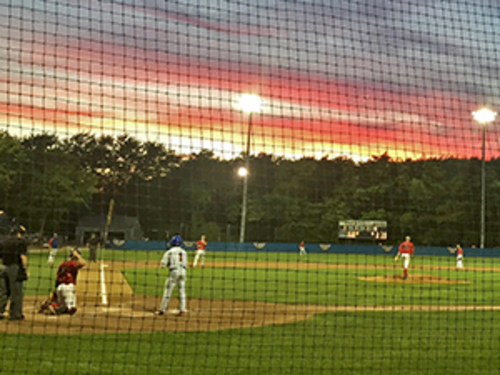 Chatham's DJ Artis steps into the box on a picture-perfect Cape Cod evening at Veterans Field. CHATHAM, Mass. 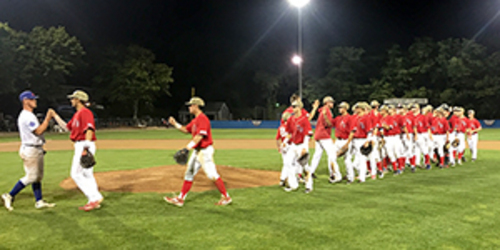 – The Yarmouth-Dennis Red Sox advanced to their third consecutive Cape Cod Baseball League championship series on Tuesday evening, earning the East Division Playoff Championship with a 4-1 win over the Chatham Anglers at Veterans Field. Three runs in the first two innings for two-time defending-champion Y-D was too much for Chatham to overcome, as the Red Sox led wire-to-wire to stretch their 2016 post-season winning streak to four games entering the championship round. William Montgomery tossed six innings of one-run ball for Y-D, allowing just two hits with four strikeouts. Deon Stafford Jr. and Corey Dempster each recorded two hits in the contest, while the duo combined for two RBIs and two runs. Y-D players celebrate before shaking hands with the Anglers following their East Division Playoff Championship victory. JJ Muno led off the game with a single, before coming around to score on a hard-hit double into the left-center field gap by Kevin Smith. Smith was then driven in by Stafford Jr. to make it 2-0 before the Anglers came to the plate. The Red Sox were back at it in the second inning, as Muno executed a perfectly placed squeeze bunt to score Dempster and make it a three run lead for the visitors. The 3-0 score held until the fifth inning, when the Anglers got on the board for the first and only time in the contest. An RBI groundout by Jake Palomaki scored Donovan Casey to make it a 3-1 contest in favor of Y-D.
Chatham threated to tie the game in the bottom of the eighth inning, putting the tying run on first base with Jeremy Vazquez at the plate. Vazquez took a two-strike fastball down the left field line that looked destined to knot the score, but it fell just inches foul; Vazquez went on to fly out to left, ending the threat. Y-D got an insurance run in the top of the ninth, when Nolan Brown drew a two-out walk to extend the inning. Dempster then turned on a ball into the left-field corner, scoring Brown from first base to make it a 4-1 ballgame. Sam Delaplane worked 1 2/3 scoreless innings—including a 1-2-3 ninth inning—to earn the save and seal the win for Y-D.